Under the name HID FARGO Connect, HID Global unveiled what it calls the industry’s first cloud-based card issuance solution for the personalization of both ID cards and mobile credentials. If you present an ID card printer to the Internet it is an unsecured device so you need to protect it … The HID FARGO Connect Console serves as the secure element between the printer and the network. 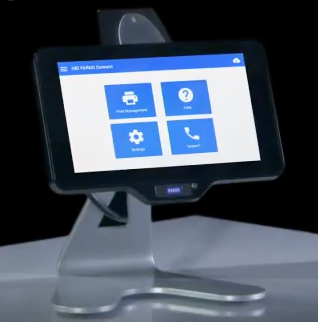 By replacing the old paradigm of standalone printers tied to dedicated PC workstations, this new offering enables secure personalization of ID cards from any location and from any web-enabled device. It lets system administrators remotely monitor and manage consumables, as well as introduces greater visibility into the entire credential issuance process. “HID FARGO Connect is the biggest innovation that the ID card issuance industry has seen in more than a decade, and with it HID is changing the way cards and credentials are issued forever,” says Craig Sandness, Vice President and Managing Director of Secure Issuance with HID Global. How does HID Fargo Connect work? In traditional card printing environments, one ID card printer was typically controlled by one dedicated workstation. In this new environment, ID card printers are connected to the Internet just like networked paper printers commonly are in offices. For secure ID printers, this topology has been largely avoided for its security limitations. With HID FARGO Connect ID card printers are edge devices on the network, or more accurately on the cloud, and can be communicated with through secure web-enabled devices. This physical piece of equipment, called the HID FARGO Connect Console, functions as a gateway between the cloud and the printers, holding the Identrust digital certificates and ensuring that only trusted instructions are delivered to the printers. According to Sandess, one console can support numerous printers, and he says that they have already driven as many as six printers from a single console with the capacity to run more. He adds that they never store personally identifiable information (PII) in the cloud environments. Aligning with the popular Apple Store concept and experience, card office employees outfitted with tablets now meet students proactively. The personalization data and photo can be captured from anywhere in the office or out. Today, the solution is able to support a couple of key one card and security systems providers, but the intent is to open it up to the entire channel, explains Robin Tandon, Director of Product Marketing of Secure Issuance at HID Global. The HID Global physical identity and access management platform, Quantum Secure, is an early example of a security solution that supports HID FARGO Connect. In the education vertical, one of the leading providers of campus ID card solutions, CBORD, is already supporting the technology. Among the first issuers to use HID FARGO Connect is Kent State University, a CBORD campus card client. According to university officials, the issuance of thousands of student IDs during orientation has been streamlined and the student experience improved through its shift to the new cloud-based approach.